Dr Chiang Wen Chin obtained her Bachelor of Medicine and Bachelor of Surgery from the Nottingham University, United Kingdom. She completed her Paediatric training in Bristol and Great Ormond Street, United Kingdom. She obtained her specialist qualifications of Master of Medicine in Paediatrics and membership to the Royal College of Physicians (United Kingdom). She is registered with the General Medical Council (UK), has also been conferred Fellowship by the Royal College of Paediatrics and Child Health (UK) and is a Fellow of the American Academy of Asthma, Allergy and Immunology (USA). She has been conferred a Fellow of the Academy of Medicine, Singapore. Dr Chiang is a visiting Consultant in Paediatric Allergy and Immunology in KK Women’s and Children’s Hospital . 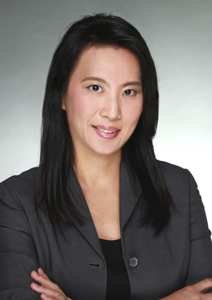 She is presently an Adjunct Associate Professor of Duke NUS Graduate Medical School Singapore and Tutor at the Yong Loo Lin School of Medicine, National University of Singapore. Dr Chiang underwent advanced training in Paediatric Allergy and Clinical Immunology at Duke University, USA in all aspects of allergy including food allergy, asthma, rhinitis and eczema care. She has been actively involved in food challenges and oral immunotherapy in children with food allergies. She is a member of Allergy and Clinical Immunology Society of Singapore, fellow of the Academy of the Allergy, Asthma and Immunology and Singapore Paediatric Society and President of the Allergy Asthma Association in Singapore. Her sub-specialty interest includes management of children with food allergies, asthma, allergic rhinitis, eczema, drug allergies, house dust mite immunotherapy and immunodeficiency. There are programs for food oral immunotherapy including programs for baked egg, milk and peanut. She has helped set up the sublingual Immunotherapy program and food and drug provocation programs in KK Woman's and Children's Hospital in Singapore. Drug provocation to eliciting drugs if clinically indicated. Elimination of appropriate antibiotics if clinically indicated. Studies have shown that food allergy affects 10% of children up to 1 year of age; between 4-8% of children aged up to 5 years of age and approximately 2% of adults. The majority of food allergies in children are not severe, and will be ‘outgrown’ with time. However, there will be a proportion of children whose food allergies will remain ‘lifelong’. While allergies tend to run in families, it is impossible to predict whether a child will inherit a parent’s food allergy or whether siblings will have a similar condition. Some research does suggest that the younger siblings of a child with a peanut allergy will have a much higher risk to being allergic to peanuts. Other triggers such as herbal medicines, fruit and vegetables have been described and almost any food can cause allergic reactions and this should be evaluated carefully. What is food allergy or food intolerance? An adverse reaction to a food can be the result of either a food allergy or a food intolerance. Many people think these two terms mean the same thing, but they are not. An IgE mediated food allergy can result reactions following ingestion of offending food. Most food-related symptoms occur within two hours of ingestion; often they start within minutes. In some very rare cases, the reaction may be delayed by four to six hours or even longer. Delayed reactions are most typically seen in children who develop eczema or rash as a symptom of food allergy and in people. Food intolerance and adverse reaction to foods with symptoms such as headaches after overindulging in chocolate or red wine, or bloating after drinking a milkshake or eating too much pasta due to lactose intolerance. How do we diagnose food allergy and confirm food allergies? Diagnosing a food allergy requires a history of the symptoms and their duration after eating, the food or foods eaten prior to the onset of symptoms, the amount of each food eaten, and whether similar reactions have occurred before. Symptoms typically appear within minutes to two hours after a person has eaten the food he/she is allergic to. There are two tests most commonly used to begin to determine if an allergy exists—a skin prick test or a blood test, such as a food specific IgE tests . The allergist may consider the use of some of these test results along with the medical history to make a food allergy diagnosis. In cases whereby any food allergic reaction has previously occurred, an oral food challenges usually in the form of open challenges maybe carried out in a clinic equipped with resuscitation facilities and staffed with trained allied health personnel to determine the likelihood of the child developing oral tolerance to the food. What are some of the common food allergies that we deal with ? Egg allergy is the most common food allergen in childhood in Singapore. In majority of cases, egg allergy is transient and children will develop tolerance to egg (therefore be able to eat egg and egg by-products) in 80% of cases. However, this is not the case in some children with egg allergy and the careful introduction of baked foods under medical supervision in a clinic or hospital equipped with resuscitation facilities and staffed with trained allied health personnel is recommended. To determine if the egg allergy has resolved, an oral food challenge is recommended. Cow’s milk allergy can be ranging from IgE mediated immediate-onset and non-IgE mediated delayed-onset types according to the timing of symptoms and organ involvement. Cow’s milk allergy has a favourable prognosis, as most children will outgrow their allergy by adulthood. The clinical diagnosis in IgE mediated disease is made by a combination of typically presenting symptoms, soon after ingestion of cow’s milk, and evidence of sensitisation (presence of specific IgE). The spectrum of clinical severity ranges from skin symptoms only to life-threatening anaphylaxis. Clinical assessment should include a severity evaluation to ensure affected individuals are managed at the appropriate level. The clinical diagnosis of non-IgE mediated disease is suspected by the development of delayed gastrointestinal or cutaneous symptoms that improve or resolve with exclusion and reappear with reintroduction of cow’s milk. As with IgE mediated disease, non-IgE mediated disease varies widely in clinical presentation from eczema exacerbations, mild gastrointestinal symptoms such as allergic protocolitis to life-threatening shock from gastrointestinal fluid loss secondary to inflammation (Food Protein Induced Enterocolitis Syndrome (FPIES). Introduction of the appropriate diary containing food under medical supervision in a clinic or hospital equipped with resuscitation facilities and staffed with trained allied health personnel is recommended. If confirmed cow milk allergy, specialised formula milk such as extensively hydrolysed formula or amino acid formula or soy maybe recommended. Peanut and Tree nuts food allergies tend to be persists into adulthood. In the case of peanut allergy, there are new updated guidelines in 2017 in order to define high, moderate and low-risk infants for developing peanut allergy. The guidelines also address how to proceed with introduction based on risk. The updated guidelines are a breakthrough for the prevention of peanut allergy. Peanut allergy has become much more prevalent in recent years, and there is now a roadmap to prevent new cases food allergy. This field is evolving quickly, some of these strategies offered maybe important to discuss early on with your doctor for early intervention. According to the new guidelines, an infant at high risk of developing peanut allergy is one with severe eczema and/or egg allergy. The guidelines recommend introduction of peanut-containing foods as early as 4-6 months for high-risk infants who have already started solid foods, after determining that it is safe to do so under supervision and advice by an Allergist. Whole peanuts should never be given to infants as they are a choking hazard. Clinical studies are ongoing in food allergy to help develop tolerances to specific foods. If you suspect an allergy to a specific food, seek medical advice before introducing it the food. In children with confirmed cow's milk and soy allergy, appropriate formula is available on prescription from your doctor. My child has food allergy: Should I expose the child to the food they are allergic to or should I avoid the food? The paradigm change in food allergy management is that studies presently that show that feeding some children (depending on which allergen they are allergic to) baked milk or baked egg may help them outgrow their allergy at a faster rate than those who avoid the food allergen completely including all by products. However, we will need to be careful to whom we introduce a baked product containing the allergenic food to as a small number of children will react severely even to a baked product containing the offending allergen. We will advise initial reintroduction to be performed in a facility that can manage food associated anaphylaxis. In cases whereby severe anaphylaxis has occurred, we will advised strict avoidance of the food allergen including all baked foods containing the allergen. The parents and child must be equipped with an adrenaline auto-injector (Epipen) and taught how to use it appropriately. Why are food allergen challenges performed? Person has outgrown an existing food allergy. Suspected food allergy is an actual allergy, when the history or allergy tests are unclear. associated with an actual clinical allergy to that food. How is an oral food challenge conducted? Initially, the dose of food is very small, but the amount is gradually increased during the challenge. Your child will be carefully monitored to see if a reaction occurs. Why are food allergen challenges sometimes performed following other food allergy tests? A positive food allergy test (using skin prick tests or blood tests for allergen specific IgE) means that a person's immune system has produced an antibody response to that food. We call this being sensitized. However, sometimes false positives can occur, which means that the test is positive yet the person can eat the food without any symptoms. For this reason, it can be important in some circumstances to confirm the significance of a positive allergy test with a food allergen challenge. What are the implications of a successful (negative) food allergen challenge? If the challenge is successful and does not result in any allergic reaction, the challenge food will need to be regularly included in the diet. This is very important as some people who do not eat the food for long periods may become sensitized once more and have allergic reactions again. It is recommended that the food is eaten at least 3-4 times a week. If you think this will be difficult, you should discuss this with your doctor before undertaking the food allergen challenge. What are the implications of an unsuccessful (positive) food allergen challenge? If an allergic reaction occurs during the challenge: This will be treated with medications as needed for the reaction elicited by the food challenge. It will be necessary to stay under medical supervision for a period of time after the challenge. The food must continue to be avoided. Unfortunately, the severity of the allergic reaction during the challenge does not provide any information regarding the severity of any future reactions. For example, if a person has only a mild allergic reaction during the challenge, a reaction on another occasion could be much more serious and even be life-threatening (anaphylaxis). It is possible to discuss an food oral immunotherapy program if your child fails the oral food challenge. How do you prepare for a food allergen challenge? You may be asked to bring in the challenge food on the day, depending on what food allergy is being assessed. The person being challenged must be well on the day of the challenge. Your child’s allergies including asthma and eczema should be controlled prior to the food challenge scheduled. Bring things to occupy the child, as the food allergen challenge can take some time. You may be asked to bring in a soft or liquid food which your child is not allergic to and likes to eat, to help with the challenge process. It can be used to mix with the challenge food. You can only prevent the symptoms of food allergy by avoiding the allergenic food. After you and your healthcare professional have identified the food(s) to which you are sensitive, you must remove them from your diet. Read the list of ingredients on the label of each prepared food that you are considering eating. Many allergens, such as peanut, egg, and milk, may appear in prepared foods you normally would not associate them with. In United States, most European countries and in Japan, most manufacturers have been required by law to list the ingredients of prepared foods. In addition, food manufacturers must use plain language to disclose whether their products contain (or may contain) any of the top eight allergenic foods—egg, milk, peanut, tree nuts, soy, wheat, shellfish, and fish. Since February 2010, the food labelling laws above have been enforced by Singapore Agri-Food and Veterinary Authorities of Singapore (AVA). How common is eczema and why does eczema happen? Eczema (also known as atopic dermatitis) is most common in infants where it occurs in around 1 in 5 children in Singapore. It is also present in older children and adults but usually improves with age. Although eczema can be effectively treated and managed, no cures are currently available. Why some people develop have eczema is not well understood. It is common for people with eczema to have or develop other allergies such as rhinitis and asthma. The skin in people who suffer from eczema is different from those people who do not have eczema. In people with eczema the skin barrier does not work as well. The skin has less water retaining properties, and moisture is easily lost from the skin causing it to dry out easily. What symptoms does eczema cause? Eczema affects the skin, causing redness, itching, oozing and over time rough hard thickened skin may occur. It is a disease that gets better or worse over the space of days, weeks and/or months. When eczema worsens this is called an eczema flare. Up to 40% infants with moderate or severe eczema will also have an immediate allergy to food(s). In some young infants with severe eczema, removal of certain food(s) may result in better eczema control. This should always be conducted under the supervision of a medical specialist in association with dietitian with specialized knowledge in food allergies. Skin prick testing is appropriate in these cases to evaluate and advise on appropriate food elimination if necessary. Avoiding triggers such as physical triggers from heat, sweat and changes in ambient temperature can be very helpful in keeping eczema under control and in decreasing the severity of flares. House Dust mites, animal dander, cockroach, molds and pollen allergy can be common triggers for eczema flares. Eczema is very prone to infection with bacteria like Staphylococcus aureus and herpes viruses. Some people with eczema just need infection treated as it occurs and others may require long term prevention strategies. Itch can be a very distressing symptom in eczema and is difficult to treat. Itching to areas of unaffected skin can rapidly cause eczema lesions to appear, so it is vital to try and control itch as much as possible. Cold compresses may help with itch. Short term use of wet wraps can often help with itch and rehydrate the skin. Advice will be given for the use of topical medications to manage eczema flares. Advice will be given on optimal moisturiser care. How can we manage Eczema? We provide a detailed assessment of your allergy triggers and work closely with you on an individualized eczema care plan to optimise your eczema care. We have a team of nurse specialists who will work together with you and your child to ensure continuity of care. Rhinitis affect almost 40 % of teenage children and up to 15-20% of adults in Singapore and have a considerable effect on their quality of life, sleep and school as well as work performance. There is also significant socio-economic impact in terms of health care utilization, treatment costs and loss of school and work days. Allergic rhinitis (AR) is defined by symptoms of sneezing, a runny or stuffy nose, or a blocked nose, accompanied by raised levels of allergen-specific IgE or a positive reaction to a skin prick test (SPT). Minimization of exposure to allergens is often advised in patients with allergic rhinitis. Although the benefit is controversial, some patients may find partial relief. Locally, house dust mites such as dermatophagoides are found in abundance. Blomia tropicalis (BT) is a unique dust mite present in tropical and humid climates like Singapore. Antihistamines celebrated their centenary year in 2010 since the discovery of histamine in 1910. When antihistamines are used for management of allergies, the newer non-sedating antihistamines are recommended because of the reduced side effects, compared to the first generation antihistamines, such as drowsiness, sedation, reduced rapid eye movement (REM) sleep, impaired driving ability and impaired concentration when used for a duration of 4 weeks or more. Antihistamines such as loratidine, cetirizine, desloratidine, fexofenadine, rupatadine and levocetirizine are considered less sedating for longer term use for management of allergic rhinitis . First generation antihistamines such as chlorpheniramine, diphenhydramine or promethazine are advised for short term use during acute illnesses. The intranasal corticosteroids are important for the management of nasal congestion and symptoms of rhinitis. Patients have to be educated on the correct technique in nasal spray application. There is no evidence that intranasal corticosteroids impairs growth parameters. A therapeutic trial of 4 weeks, or longer as clinically indicated, is advised. Sublingual Immunotherapy (SLIT) is a method of allergy treatment that uses an allergen solution or fast dissolving tablet is given under the tongue, which over the course of treatment, reduces sensitivity to allergens. Sublingual immunotherapy has a very good safety profile and is given at home. What medications are used in the management of allergic rhinitis? Allergic rhinitis is a condition that is present in up to 40% of our teenage children in Singapore. The current management of allergic rhinitis includes intranasal corticosteroids, antihistamines and occasionally leukotriene receptor antagonists for symptom control. As adjunct therapy for the treatment of moderate to severe allergic rhinitis, house dust mite immunotherapy has been shown to be useful in improving symptoms and reduction of medications use for symptom control. Recent long-term trials demonstrate that sublingual immunotherapy (SLIT) drops or tablets appears to interfere with the atopic march and allergic progression from rhinitis to asthma, with reduced onset of new environmental sensitization. A thorough health history and skin prick tests or blood tests are the most common methods for determining the allergic rhinitis triggers. Majority (>90 %) of children in Singapore suffer from perennial allergic rhinitis and are primarily sensitized to house dust mite such as Dermatophagoides pteronyssinus and Dermatophagoides farinae and Blomia tropicalis and these dust mites are a source of trigger to their allergies. Some are individuals are co-sensitized to other indoor allergens, such as cockroach, animal dander such as cat and dog (dried skin flakes and saliva) and indoor mold. Whom can we start Sublingual Immunotherapy? 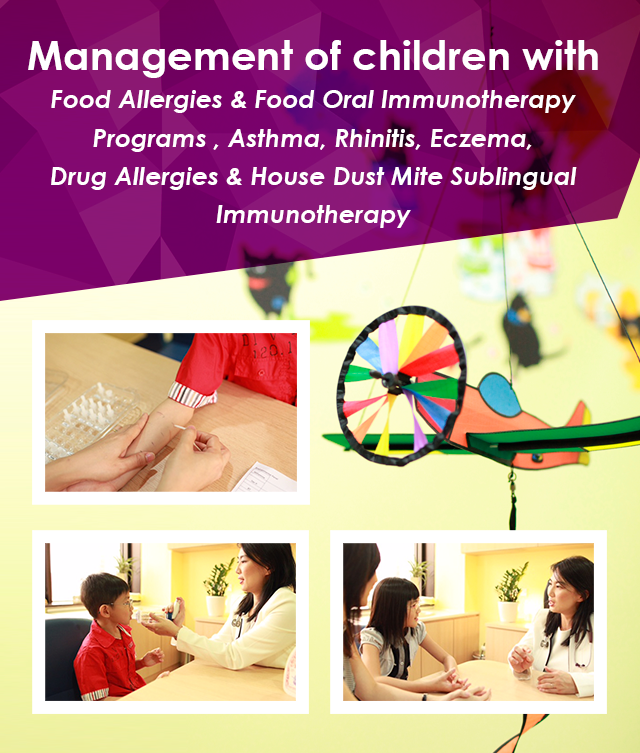 We offer sublingual immunotherapy (SLIT) for House Dust mite sensitized children from 4 - 5 years of age with stable asthma whose allergic rhinitis symptoms are not well-controlled on nasal corticosteroids and antihistamines. SLIT is presently advised for a minimal duration of 2-3 years. Although proven to be effective in symptom control with minimal adverse effects, compliance and patient adherence to therapy and parental supervision is of utmost importance. Children who may benefit from sublingual immunotherapy (SLIT) include children with prolonged or severe symptoms of rhinitis, and co-existing conditions such as asthma or recurrent sinusitis. If symptoms interfere with quality of life and/or ability to function despite being on topical or oral medications whereby the patients feel that the medications are ineffective in management of allergies, house dust mite SLIT therapy maybe recommended. What is asthma and does asthma “go away”? Asthma is a heterogeneous disorder with many different clinical subtypes. Although the majority of asthma cases begin in childhood, a significant proportion of children or adolescents will outgrow their disease completely, with others experiencing long remissions with occasional relapses. For a small number, asthma becomes progressively worse, leading to lifelong morbidity and even mortality. Are there any predictors of asthma outcomes? Low spirometric flow, as measured by FEV1, persisting from childhood into early adulthood has consistently been associated with continued asthma symptoms as adults. Low FEV1 also predicts subsequent asthma attacks in children and adults, and relapse of asthma symptoms on withdrawal of therapy. Traditionally, FEV1, which is reported to be objective and reproducible, has been the gold standard for the assessment of asthma severity and control in almost all clinical pharmacological trials. However, the observation that a great majority of asthmatic attacks occur in children with normal FEV1 as well. The long term prognosis for these children with normal lung function is that their asthma is likely to “go away” rather than persists to adulthood. What is the natural history of asthma? Most children outgrow their asthma in the 1st decade of life. However, there will be children who will continue to have asthma exacerbation into teenage years and adult life. This may be triggered by viral illness, exercise, stress and allergens in the environment. Is there any way to predict if the child will have persistent asthma into adulthood? Presence of family history of atopy, intensity and frequency of wheeze, knowledge of sensitization to aeroallergens, lung function testing and non-invasive biomarkers, such as exhaled nitric oxide, allows the physician to assess the likelihood of the patient having future asthma attacks. The aim of asthma care is to archive asthma control and to reduce emergency care utilization and hospitalization, reduce the frequency and severity of exacerbations, and reduce oral steroid use. We are unable to “cure” asthma as each individual has an asthma pattern that is unique to them. Their asthma may be triggered by viral illness alone or multi-triggered asthma, which is asthma triggered by exercise, emotions and viral illnesses. We individualized your child’s asthma action plan to achieve “asthma control” regardless of the severity of asthma to improve your child’s ability to have better quality of life and optimize their level of activities . This control is the degree to which symptoms are minimized by regular preventer medications at the lowest dose that can be achieved under physician supervision. The key to a successful partnership to achieve asthma control is a combination of doctors follow-up at 3-4 monthly intervals to adjust dosing of medication (stepwise titration of preventer medications) and patient education and adherence especially with a written asthma action plan (WAAP). The WAAP empowers the patients to manage their asthma in a timely and dynamic manner, reducing the risk of deterioration of asthma attacks and reducing unscheduled visits to the emergency room. We have a team of nurse specialist that is able to optimise correct technique or either direct inhaler application, including use of spacer device in children, to optimise patient care. This may include asthma diaries and peak flow diaries to improve asthma care and education for the child. Are all asthma medications the same? Many well designed asthma trials have shown that patients often have individual responses to asthma controller therapy. There is no single asthma controller medicine that can achieve total control in all patients. Therefore, the doctors will individualize the therapy based on the child’s age, severity and response to the medications. We will often advise asthma control on the lowest dose of medications required, this may include low dose inhaled corticosteroids and/or leukotriene antagonist and/or combined long acting beta-agonists/inhaler steroid medications. In moderate to severe asthma, step up to Anti-IgE therapy maybe recommended. Proper technique in application of the asthma medications that has been prescribe is the cornerstone to success in asthma management in patients. Do most children with asthma have rhinitis? Allergic rhinitis and asthma are conditions that often coexist in the same child. It is important to understand the natural history of airway disorders and to risk assess the risk of future asthma attacks in these children. The history and follow up is paramount to determine in children if only rhinitis or asthma is contributing to their symptoms as optimal treatment often results improvement in long term outcome for their asthma and rhinitis. Is drug allergy common in children? Allergic reactions to drugs are considered rare in the paediatric population. In a hospital based review of the electronic records of all 8437 inpatients admitted to KK Children’s Hospital in a 5 month period, we found that 2.6% of the patients were reported to have adverse drug reactions (ADRs). The most commonly involved medications were antibiotics (45%) and non-steroidal anti-inflammatory drugs (NSAIDS) (18.5%). What types of drug allergies are commonly seen locally? Locally, non-steroidal anti-inflammatory medications, mainly ibruprofen and paractemol are commonly used in this population for fever and pain management. Drug provocation testing with the inciting antipyretic such as paracetamol or non-steroidal anti-inflammatory medication revealed that facial especially periobital angioedema and urticaria were the key features in a dose-dependent, potency-dependent manner. Cross reactivity between different NSAIDs was evident in a subpopulation of young Asian atopic children. Do we need to test for all drug allergies? The history is the most important aspect of assessing a possible adverse drug reaction. What was the time interval between ingestion/administration of the drug, and the onset of reaction? Was the nature of reaction in keeping with known adverse reactions to the drug? Did the reaction resolve with cessation of the drug? Were other drugs administered at the same time which could cause the reaction? Was/were there any underlying condition(s) of the patient which could explain the reaction? In case of immediate type hypersensitivity reactions, suspected drug allergy can be determine using skin prick testing, followed by oral provocation testing with the suspected antibiotic. These drug challenges are performed in a facility that can manage drug associated anaphylaxis. This drug challenge can help to dispel the wrong labelling of ‘drug allergy’ in children who had presented with a viral rash during an illness with concurrent drug use. In the case of Paracetamol and NSAIDs (Non- steroidal anti-inflammatory drugs) drug allergies, a drug provocation maybe recommended or alternative drugs can be recommended with consultation with your allergist as some individuals react to single NSAIDs drug whilst others may react to multiple NSAIDs drug. Patients who have a convincing history of severe anaphylaxis to a medication will not be suitable for an oral challenge. Consultation with the Allergist with a review of the patient’s history and review of systems will therefore be necessary prior to consideration of the next appropriate management for the child. In the case of IgE mediated reactions to antibiotics, skin prick testing with a panel of antibiotics will be performed prior to challenge. Appropriate advice is administered to patients if they are proven to be drug challenge negative, and alternative antibiotics recommended for cases that are drug challenge positive. Where there is suspicion of a drug allergy and a need to confirm the diagnosis in the setting of negative skin or blood tests to the antibiotics, then controlled challenge with the drug is a useful diagnostic tool. Challenge testing must only be performed by appropriately trained medical specialists where resuscitation facilities are available.